Light hors d'oeuvres are acceptable during an afternoon reception. Your wedding guests will expect you to serve food at the reception, but the time of the reception dictates what types of foods you might serve. Whenever you schedule your wedding during what would normally be a meal time, plan to serve a full meal to your guests. If you wish to avoid the cost of full meal service, plan your wedding and reception during the mid-afternoon or evening hours, when you can serve finger foods. Use your invitations as a way to tell people what food to expect. For example, if your wedding ceremony starts at 5 p.m., you might include a statement such as, "Dinner and reception to follow." If the wedding is at 1 p.m., you might say, "Join us for cocktails and hors d'oeuvres after the ceremony." At the reception, you want to keep your guests happy. When you've planned your wedding during a meal time, make sure that meal is served at an appropriate time. For example, if your wedding starts at 4:30 p.m., guests are likely to be hungry by the time they get to the reception. You'll likely want to have a few appetizers for guests to eat as they arrive, followed by dinner soon after. If you've planned a cocktail hour, your hors d'oeuvres should be plentiful, with a few substantial snacks, such as small sandwiches or spanakopita. 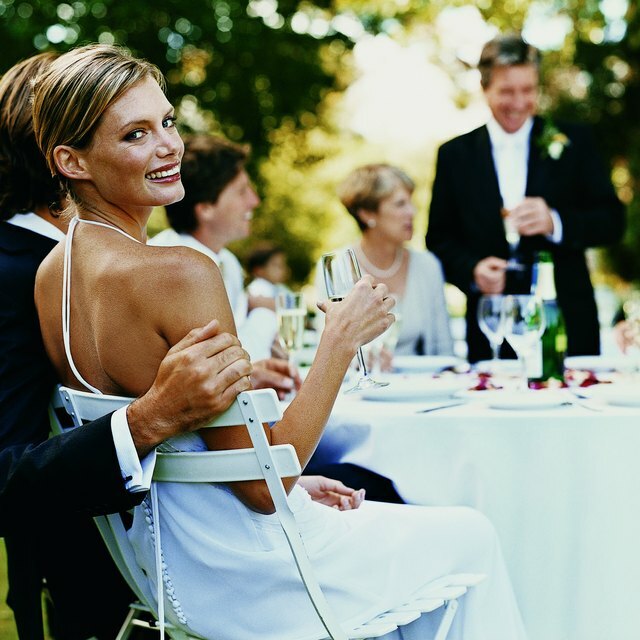 The Knot: Wedding Food & Drink -- Do I Have to Serve a Full Reception Meal?